VDARE.com’s James Fulford recently noted that “exemplary sentencing”—shockingly draconian punishment—is credited by the British Establishment with crushing British working class resistance to Third World immigration after the 1958 Notting Hill riots. But the U.S. Federal government—under Democrats and Republicans alike—has been punishing working class white Americans for engaging, not in street violence, but in symbolic protest against “diversity”—even though symbolic speech is supposed to be protected by the First Amendment to the U.S. Constitution since at least the late 1990s. Of course it is scandalous that journalists John Derbyshire and Naomi Schaefer Riley have lost their jobs for crimethink. But for more than a decade, working class Americans have been actually going to jail. Most people don’t know about this development, because the national MSM has refused to report on it, and those who pretend to be defenders of civil liberties, such as Nat Hentoff, Richard Epstein, Cong. Ron Paul, Megan McArdle, and (with one exception) the American Civil Liberties Union have ignored it. Last spring, “libertarian” Chicago Tribune columnist Steve Chapman attacked his white readers for even asking what race the “flash mobs” in Chicago were. Thus working-class whites unconstitutionally charged with “hate crimes” for symbolic expression are utterly isolated, and forced to submit. Mocking blacks has been transformed into a felony. And blacks are now expanding this ideological terrorism, asserting that merely criticizing “Barack Obama” is a crime. The abolition of whites’ First Amendment rights also entails the abolition of their 14th Amendment right to equality before the law. While whites are illegally arrested and prosecuted, blacks are given carte blanche not only to spew racial epithets against whites, but to do so while committing felonies against them. Thus, whites endure hyper-policing, while blacks enjoy de-policing. Brian Swetnam: Ten Years In Jail—For Burning A Cross??? 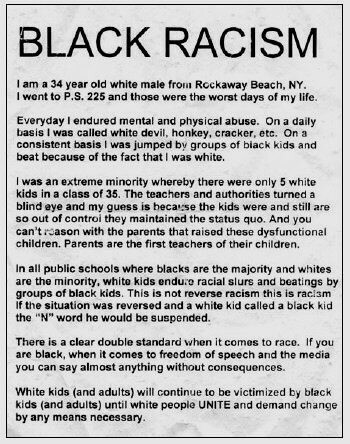 A friend of Brian Swetnam, a white student at Bowie, Maryland’s Bowie High School, had been beaten by racist black “students.” Swetnam and three of his friends considered hiring someone to kill the racist thugs, but decided instead on a non-violent, purely symbolic response. On June 13, 1997, Swetnam and some of the others burned a cross. The feds coerced Swetnam into pleading guilty to hate-crime conspiracy charges, and sentenced him to 10 years in federal prison without parole—more time than the typical murderer is sentenced to. Note that, had Swetnam burned an American flag, a sacred symbol millions of white Americans, he would not have been prosecuted at all. (This atrocity, ignored by the National MSM, was one of the first stories to appear on the newly-launched VDARE.com). In August 1998, Janis Barton was arrested for complaining to her mother, in a private conversation, about some Hispanics’ refusal to speak English in public. Benitez, an off-duty sheriff’s deputy, followed Barton out of the restaurant and confronted her. Barton flipped her off. Benitez wrote down Barton’s license plate number, called the authorities, and got her arrested. Benitez should have been fired, and arrested for false arrest under color of authority, along with the colleagues who aided and abetted her. Instead, she succeeded at making Mrs. Barton’s life a living hell. Thanks in large part to a leftwing, white judge, Brent Danielson, Barton was convicted of "insulting conduct in a public place’ and sentenced her to 45 days in jail. (Benitez had only asked for community service.) The authorities then claimed that after Barton had spent four days in jail, she’d agreed to plead guilty in exchange for having her sentence cut down to four days. But Barton denied this, and won on appeal (with help from the Center for American Unity, VDARE.com’s original sponsor). In October, 2000, Lonny Rae and his family lived in Council, Idaho. His wife, Kimberly, was a reporter/photographer for the local newspaper, the Adams County Record. Their two sons attended the town’s high school. When a high school football game Kimberly Rae was photographing ended, she snapped a picture of a black guest referee, Kenneth Manley, whose martinetish officiating had made for a contentious game. Manley, 6’3” and approximately 250 lbs., assaulted the 5’3” woman in trying to rip her camera off her throat. After Kenneth Manley had gone into the officials’ locker room, Lonny Rae stood outside and yelled the n-word. The Raes tried to get Kimberly’s racist attacker arrested. But instead Lonny Rae was arrested—for allegedly violating a Montana "hate crime" statute outlawing "malicious harassment." Originally brought by the city prosecutor, the charge was turned over to the state and increased to a full felony offense carrying a sentence of five years in the state penitentiary. Pressure from the referees’ association led to Kimberly Rae being immediately fired from her job, and Lonny Rae being rendered unemployable. Both were barred from the grounds of their own sons’ school. The family was evicted from their foreclosed home and ruined, long before the case ever went to court—even though Lonny Rae was eventually acquitted of the felony count before being sentenced to seven days in jail for misdemeanor "assault." The acquittal on the felony was because the jury felt that if a white man had behaved as Manley did, Rae would have called him a name, too, just different one. On December 4, 2006, a mob of 6-10 black “students” at Jena High School in Jena, LA, led by 15-year-old career felon Mychal Bell, sought to murder white classmate, Justin Barker. Activist white preacher Alan Bean (director of a Texas group, Friends of Justice) and white Chicago Tribune “reporter” Howard Witt collaborated in turning the truth upside down, and thereby creating the Jena Hoax. On September 20, 2007, some 30,000 blacks converged on Jena for a Nuremberg-style rally in support of the black attackers—“The Jena 6”. While black ralliers waited at a bus stop in Alexandria, LA on their way home, a drunken white 18-year-old called Jeremiah Munsen, along with and a 17-year-old friend, pulled a practical joke: They tied electrical cords to look like nooses from the back of Munsen’s pickup truck. Munsen then drove ‘round and ‘round the bus stop, in view of hundreds of outraged, black activists. If you’re white, merely complaining about black hate crimes can get you arrested in New York City. The NYPD Hate Crimes Task Force functions as a combination Gestapo and Politburo. On November 6, 2007, Tony L. Johnson and the Wallis brothers hung a dead raccoon in a noose from a flagpole at a school in Morehouse Parish, LA, to protest school authorities’ plan to bus more black students into the school. On the night of February 26, 2010, in a harmless, legal, laudable drunken prank, Sean D. Fitzgerald and Zachary E. Tucker, a couple of undergraduate Midshipmen at the University of Missouri/Columbia, spread white cotton balls in front of the public school’s Black Culture Center, mocking Black History Month. When non-whites commit hate crimes against whites, they get freebies, increasingly with the support of the White House—witness the case of the Nation of Islam’s New New Black Panther Party (here and here), which violated whites’ voting rights in Philadelphia on Election Day 2008 while spewing racial epithets, on videotape. Yet the authorities routinely deny that blacks are committing hate crimes. And when non-whites commit noose hoaxes, the authorities conspire to cover up the incident, including refusing to name the perpetrator. And every night in America, somewhere it is Kristallnacht.